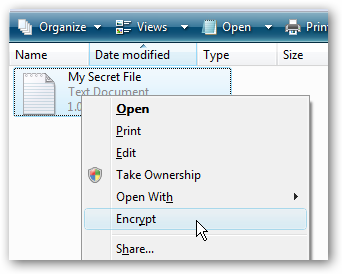 In the right-hand pane, create a new 32-bit DWORD value called EncryptionContextMenu and give it a value of 1. 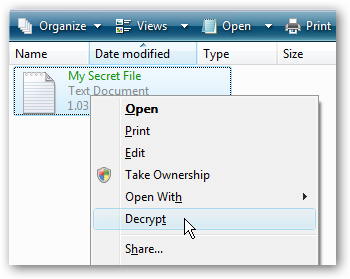 Now when you right-click on a file, you’ll see a new option called Encrypt. 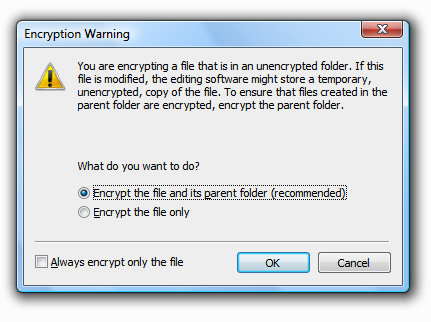 When you choose this option, you’ll receive the following dialog, asking if you want to encrypt just the file, or also the parent folder. You can also choose just the file as the default. Once the files are encrypted, you’ll notice that the title of the file is now green, indicating that it’s been encrypted. The right-click option will also now change to Decrypt.